Day One– or is it day two if you include the night on the ferry. I’m not as that was below percent wise of whatever to be counted and plus it was David’s birthday so we were allowed a ‘treat’ that night. Although how could be a treat when you are stuck on ferry and the options are a proper French restaurant (the boat is French) and a café style eatery. Of course we chose the first and to be fair before we boarded I did wonder on the prices and choice but the dinner in that restaurant was very good- David had beef and I had gilt head bream. For those to be avid followers or indeed those who know us well will realise this will follow a theme in food choices- one meat and one fish- no prizes for guessing who is who. We picked a Spanish wine to stay on course and it was excellent and only £18 for the bottle- very good indeed. So onto actual day 1 and the morning breakfast after a heavy night rocking and rolling (on the boat not clubbing) and the breakfast of homemade croissants, juice and coffee. Well the croissants were indeed homemade somewhere but I don’t think on the boat but again they were very good. Day 4 – Today breakfast has to be my dish of the day, reason why because we walked into the old town of Cacares ( Unesco World heritage site) and opted for a busy café full of morning workers (still can remember those days) and the lady waitress with our bad Spanish understood we wanted toast, fresh orange, coffee – marvellous but then in such a lovely gesture she gave us wonderful biscuits for free and then upon ordering 2 more coffees or rather just returning the cups and pointing to them she gave us the most delicious croissants again on the house, wonderful food and a wonderful gesture. All sounds, and reads, good. Not convinced on the 32km bike ride There’s cycling and there’s electric cycling. 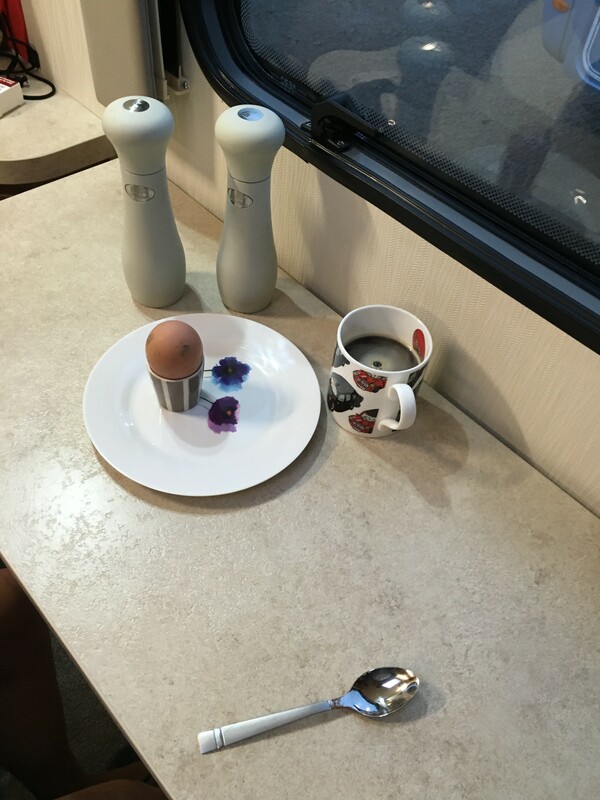 Nonetheless we are stunned and mightily impressed by the egg saga. Keep them coming. Yes electric cycling is easier that said moving an 18 stone lad like me up a 1 in 10 hill is beyond it’s capabilities. So have to say legs really hurt after.